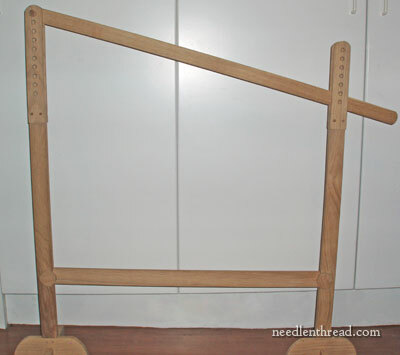 Trestles for Large Embroidery Frames – Available! If you are into historical embroidery, if you like stitching larger projects, if you do ecclesiastical embroidery and so forth, and if you work on larger embroidery frames, trestles are something you’ve probable thought about! Maybe you’ve seen them in use in the photos on the Royal School of Needlework’s website, or pictured in their books, supporting slate frames. Or maybe you’ve worked with large frames and experienced the discomfort of trying to support them on the edge of a table, and wondered if there was another solution to holding up your frame. Trestles are the best support solution, really, for large, independent embroidery frames such as slate frames, Millenium frames, and large Evertite stretcher bars, but the’ve been pretty difficult to come by in the States. Over in the UK, the Royal School of Needlework supplies trestles, and so do a few independent needlework artists who have shops. But here in the US, they’ve been somewhat slow to catch on. At one point, Evan Burroughs (the inventor of the Evertite frame) was offering a set, and rumors circulated a bit that the RSN classes in San Francisco would soon be offering them. I even had a friend’s father up in Michigan toying with making some. Those options all fizzled – or at least, they’re a long time coming, if they haven’t altogether fizzled – so I got to thinking about how to come up with my own set of trestles, which in turn led me to exploring whether or not it was feasible to supply trestles for the US market. It so happens that here in Kansas, there exists a little woodworking shop that is a non-profit organization assisting developmentally challenged youth to learn life skills. Because I’ve been in education for a while and I know first hand the challenges that our youth today face, this endeavor was something that captured my attention, and I saw an opportunity to help the workshop and to supply a solution for the lack of trestles in the US. The road in developing the trestles was a little rocky, but it worked out, and I am very pleased with my own set. In the process of presenting the workshop with my ideas and working out the specifics with them, in paying for all the materials and the development of the prototypes, and so forth, I’ve learned a lot! It has been an educational journey all around. 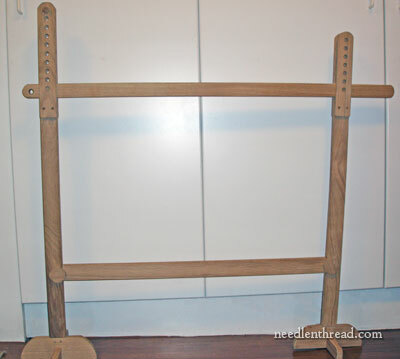 To get my trestles produced, I agreed to have a small number of trestles made in addition to my own, that I could offer here on Needle ‘n Thread. Trestles are intended to support larger embroidery frames. It’s very important to realize this, before you leap into acquiring a pair! They don’t support little frames. They comfortably support frames that are about 24″ wide or wider. The idea is that you rest the frame on the frame rest bar at the top of the trestles, and you sit between the trestles. So to use trestles, you need a frame wide enough to allow you to sit comfortably between the trestles. I use a frame that’s about 24″ wide, to be comfortable and have a little elbow room. (This somewhat depends on your size and the size of your chair, too!) But the trestles easily support frames up the 36″ wide (which is what I use when recording video) or wider. The frame can be up to 34″ deep when resting between the legs. And of course, if using a slate frame or Millenium frame, your fabric can be much longer than that, because it can be rolled onto the rollers of your frame. These trestles are made from solid oak. The oak is unstained and sanded smooth. Shown above is one trestle of the pair. It is 37.5″ deep (from front to back leg – the shorter leg is the front leg). The frame rest bar between the two legs (the top horizontal bar there) is 43″ long. The frame can sit flat (ideal for goldwork, beadwork, tambour embroidery and the like), or it can be raised to slant up at a gradual angle comfortable for stitching. The frame rest bar sits at its lowest at 33.5″ from the floor, which is slightly higher than regular table height. This prevents you from having to bend over your embroidery and helps promote better stitching posture. 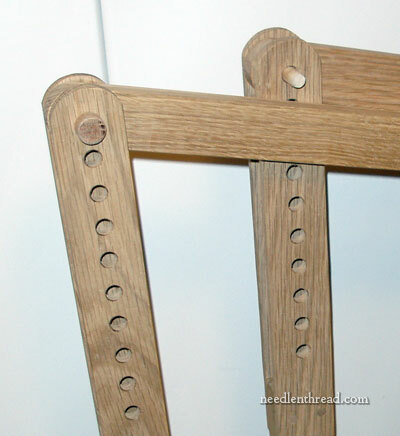 Wooden pegs (included) are used to raise or lower the frame rest bar. The trestles come as a pair. They require a little bit of what I’d call “gentle” assembly, and easy-to-follow instructions are included for that. You’ll need a Phillips head screw driver and either a soft mallet (a rubber mallet) or a hammer with a towel to protect the wood. The trestles are intended for indoor use. Before considering them, you might scope out your workspace to make sure you can accommodate them. 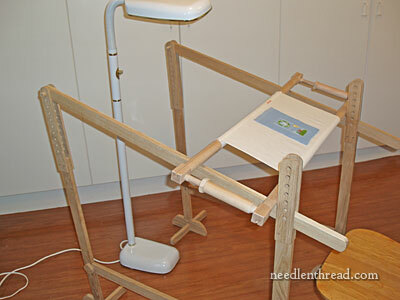 Unlike “fold up stands” and the like, trestles aren’t meant to be “temporary.” At the same time, they don’t have to be permanently set up, but they do take up more room than most embroidery stands! When I’m not using mine, I nestle them together against a wall or inside a closet. You can also disassemble them for storage. When shipped, they fit into a 10″ x 10″ x 48″ box, so that’s the maximum space they take up when disassembled. The trestles are $200 / pair. They are shipped within three days of order, only within the contiguous US. (Shipping them any farther is prohibitively expensive.) Shipping in the contiguous US is $32, via UPS ground. Right now, I have a limited supply available. Whether or not I will carry more in the future remains to be seen. Lots of factors there – whether or not there’s a demand, whether or not the workshop and I can work out the details to make it work for both of us, storage logistics for an on-hand supply, and so forth. So we shall see! If you have any questions about the trestles or would like to know more about them, feel free to ask below or drop me a line. If you’re interested, you can find the trestles available in my shop! The trestles are sold out, and due to manufacturing difficulties, will no longer be available. Sorry about that! As soon as I have a line on where else you can order trestles, I will announce it on Needle ‘n Thread and link the information up here. Thanks! December 30, 2011 Fifth Day of Christmas – Evertite Stretcher Bars! These would be good for supporting large filet lace frames too! I am so excited about this I just jove my millenium frames and stand but I do really large ecclesiatical embroideries . Will your frame accomodate a frame 50″ wide. That is largest I have had to use. AWESOME, AWESOME idea. I don’t need one as yet (first must acquire the space!!) but I see the value. Great idea and execution. Love that the you worked with youth who are challenged as well. Such a wonderful idea all around. Mary, I guess that you have already sold all the frames you had. Do you know if you will be getting anymore in the future? Email in my inbox at 9:46am. Checked your site at 11:31 am. Wow! Sold out! Looks like you have a winner. Congratulations. They did go fast, Laura! I was a little surprised, too! I was fortunate that when the RSN offered the Certificate Clases in Iowa that the organizer’s husband made them for us. If you have back/shoulder trouble they are a godsend. I believe they also prevent further damage. Just be aware-cats consider them a perfect vantage point and nap hammock. I have taken several RSN classes in the San Francisco Bay Area. The instructor, who is also the coordinator of the RSN program in the US, offers a trestle made by her husband. I haven’t bought one so I can’t comment on how well it works. As to price, it’s higher than this but much lower than the one on the RSN web site. Yes, I know exactly which one you are talking about as I have used and purchased a set. I really do love my set. I have it set up in front of my balcony window, and as they are unidirectional, I can either work with the sunlight, or pull the drapes and flip my chair to the other side and work by a lamp. I find them light weight, well constructed, and quite portable. My set have gone through a few moves and travels and have held up well. Better than me on some occasions. I think they are around $350 and worth every penny! Hand crafted and by a small local embroidery business. They will last and are an essential equipment investment. I tell my husband they are easier to carry than his golf clubs! Lucy also sells hand crafted slate frames. Did you get the trestle from Lucy’s husband? I like your set up. I’m undecided about a trestle at this point because I don’t do a lot of large pieces. I just purchased the Millenium frame after reading Mary’s blog. Will see how that goes. By the time I got your email you were sold out. Please order more. These are beautiful and I can see how these are useful. I have an antique quilt frame with grooves cut to fit the poles, is there any reason that these will not also work, especially if the embroidery is put onto the poles? They would not be height adjustable, but would allow me to work at slightly above table height. I never thought of using my quilt frame as a giant embroidery holder. I also have a hoop stand, and the q-snap floor stand and a universal frame stand, but if I would do something big like ecclesiastical altar cloth or a funeral pall, it would make sense to put it onto a larger frame. Normally I work with the blocks and then piece after I have appliqued or embroidered them. It never dawned on me how to do whole cloth embroidery. Thanks for getting me outside of my own box today. This is a great thing you have done Mary; it was imho a stroke of genius to involve underprivileged boys in making these. The price seems high, but is reasonable. When my husband first began making fine furniture etc he toyed with the idea of making artist’s easels, but there were so many imported from China or India ones out there, there was no way he could compete even though his would be top quality. Maybe we embroiderers just recognise that and the need for it, so we pay without a whinge. Of course, he (the aformentioned husband) will make some kind of stand for my Millenium frames, but it’s like the cobbler’s children – you know, the ones who were always barefooted, lol. These look great and they are so cheap at the RSN they are over £400. I would love a set of trestles but it’s the room they take up but I am thinking about it they look so goooooooooddddddd. Mary, these are so cool! And who you had make them adds to it. Even though I won’t be getting any right now*, please pass along a “Great Work!” to those who made them. *not only because they are sold out, but I’ve decided to work harder on paying off the house early. Oh drat…. sold out before I got myself to the shop to order. I do hope you will consider having more made! If so, I want to be on the waiting list and will gladly make a deposit ahead of time. They look lovely! This is wonderful! I just love how you are helping the boys and helping needleworkers at the same time! I have printed out the trestle article and will save as a must have on my wish list. Mary, Do you know much about the trestle tables from Royal School of Embroidery. I am thinking of purchasing one as I can’t find them in the states. They are very expensive so I want to be certain that I would not be dissapointed. Wasn’t sure how to contact you so am trying a couple different routes. Where you ever able to get the Trestle Frames made and do you still have any? where can I get trestles??? I have been looking for these and could never find one! Do you still have them available? Hi, Tati – no, I don’t, but you can check with Forever Embroidery Studio in San Francisco http://www.foreverembroiderystudio.com They don’t carry trestles in stock but they take orders for them. Hi, Amina – I don’t have trestles available anymore. But thank you for inquiring! We are going to build a trestle frame, designed after yours, for my personal use. Do you have a set of plans we can purchase? It has been impossible to find a frame I can set my needlepoint rug projects on . Sure don’t, Theresa – that was one of the problems with the manufacturer that caused me to quit working with him in developing these. 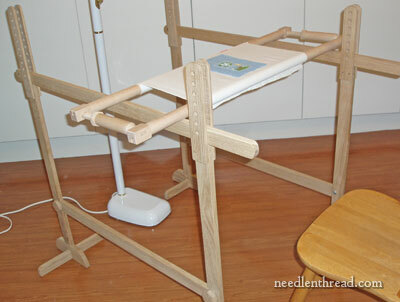 Hi, Tracy – I just wrote an article here about the ones currently available in the States: https://www.needlenthread.com/2018/05/first-things-first-my-embroidery-trestles-are-up-ready.html You’ll find contact and purchasing info at the end of the article. Thanks! I would like to purchase a trestle. Do you have any in stock?